Durham Ranch Game Birds are some of the finest poultry available. Domestically grown on small family farms throughout the eastern seaboard and California or in some cases grown naturally in the wild, Durham Ranch Game Birds are the best in quality and sustainability raised. They are humanely treated and cared for in an environment that provides a vegetarian diet. Processed under the supervision of the USDA at Sierra Meat and Seafood in Reno, Nevada and select locations throughout the USA, always under our direct supervision and to our exact specifications. Delicate and delicious, Durham Ranch game birds elevate the elegance of any menu. Please call for specific cuts. We offer a wide variety. At Diestel, creating premium quality turkey and turkey products begins with sourcing the grains we mill on our ranch and continues throughout every aspect of our operation. We source the highest-quality grains, mill our own feed, give our animals extra time to grow naturally, use multiple breeds to ensure a fully mature turkey at every weight range, and treat our animals with compassion. Our customers say Diestel turkeys have a rich “old-fashioned flavor,” incredible tenderness, and texture. Mary’s Free-Range Organic Air Chilled Chickens are an additional step up the ladder in humane farming practices; with freedom to move about and a premium diet void of any chemical stimulators. Fulton Valley Farms Anti-Biotic Free Poultry lives their lives on a Never Ever program; that is Never on Anti-Biotic Ever. 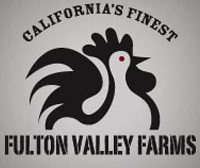 Our Free Roaming, Vegetarian eating chickens enjoy the fresh California air in their traditional style chicken barns that leaves the air flow up to what the chickens want.